There are a countless number of “free floating” planets in space. These “rogue” planets are described as “homeless worlds” that have neither a sunrise or a sunset. How can this be? These cosmic-wonders do not have a star in their midst so instead of being bound in a gravitational tug-of-war, they travel in a solitary arc around the Milky Way’s core. Once such world designated as 2MASS J2126 was thought to be one of these “unmarried” gas giants until recently when a distant star was spotted…and when we say “distance” we aren’t kidding! A team of astronomers from the UK, Australia and the Untied States have discovered that 2MASS J2126 does indeed have a companion star, but it’s located so far away that it wasn’t thought to be associated with the “free floater.” In fact, the star called TYC 9486-927-1 is about 1 trillion kilometers away from the planet (about 7,000 times the distance from the Earth to the Sun). Spotting these lonely planets are no easy task because, like gas giant worlds, these planets lack the nuclear reactions to make stars shine, so they will cool and eventually fade over time. However, astronomers are able to measure the temperatures of the object, but it depends on both the mass and age of the world. 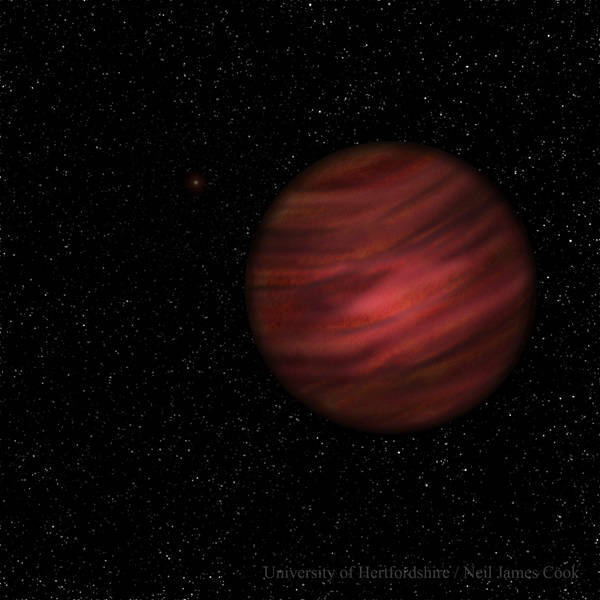 To do this they need to determine if the objects is light enough to be categorized as a planet or if it is a heavier “failed star” known as a brown dwarf. 2MASS J2126 was discovered by US-based researchers by using an infrared sky survey. It was then flagging as a possibly young, low-mass object. In 2014, this same object was identified by Canadian researchers as a possible member of the Tucana Horologium Association; a 45 million-year-old group of stars (and brown dwarfs) which made it young and low enough in mass to be classified as a free-floating planet. Astronomers were excited by the prospects that TYC 9486-927-1 and the “loney planet” may indeed to orbiting each other, especially lead author Niall Deacon of the University of Hertfordshire. He and his team have spent the last few years searching for young stars with companions in wide orbits and finally found the possible link between TYC 9486-927-1 and 2MASS J2126; they are both moving through space together at about 104 light-years from the Sun. Using the dispersed light to measure the strength of a feature caused by the element lithium, the team was able to piece together the approximate age of the star–the more lithium it has, the younger the star is. TYC 9486-927-1 does exhibit stronger signatures of lithium than the Tucana Horologium Association; however, it is weaker than a group of 10 million-year-old stars. Even so, astronomers do know 2MASS J2126 is around 7,000 Earth-Sun distances which gives it the widest orbit of any planet found around another star! This huge distance means it takes approximately 900,000 years to complete one orbit! With these estimates 2MASS J2126 has only completed about fifty orbits over its lifetime. There is a slim to none chance of any life being on this once lonely planet, but if there were to be, their “Sun” would be just a bright star in the far off sky. Name a star now! - “Free Floating” Planet Has a Star!